From voaspecialenglish.com | facebook.com/voalearningenglish People with musical instruments come ready to play. Strangers get up to dance. Crowds gather around. You can find them each Sunday at Meridian Hill Park in Washington, DC. For years, Willy Posey has been part of the Meridian Hill Park drum circle. WILLY POSEY: "A few guys gathered together and they just started the circle. And it just grows, grows, grows more and more over the years." Abdel Elgizouzi has been coming to the drum circle since moving to Washington from Sudan. ABDEL ELGIZOUZI: "Twelve years ago, there are a group of about 10, 15 black old male playing. Now you see, there is almost 150 drummers." 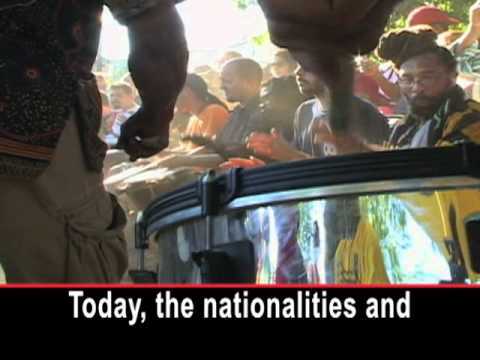 Today, the nationalities and ethnicities of the Meridian Hill Park drummers are as different as the instruments and the beats they play. Kevin Lambert was the first white person to play at the circle. KEVIN LAMBERT: "Several people stopped the drumming when I would show up and say, 'You can't play with this white boy.' And this went on for a while. And the leader of this finally said, 'You cannot pull any racism in this. This is about music. This is not about black or white. This man can play. He stays.' And as soon as he said that, everyone shut up and it was over." More newcomers arrive each week. ADBEL ALGIZOUZI: "It is not only now black. It is black, Chinese, Hispanic, white, everywhere. And everybody come with a drum from his country, from his region, from his people." Music lovers are always welcome. KEVIN LAMBERT: "This sort of morphing together. The African rhythms, the project beats and the Cuban rhythms, the salsa rhythms." The beats become one as different people interact. ABDEL ELGIZOUZI: "And that is the bottom line of this circle." WILLY POSEY: "Just come on in here and just join in with us in the spirit, and we can just keep growing." I'm Steve Ember. Видео Drum Circle Widens Into a United Nations of Beats очень пригодится тем, кто хочет выучить английский язык.